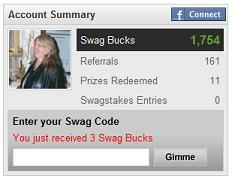 There is a code hunt on the Swagbucks Facebook fan page. TSG loves back to school, his favorite classes are History, Math and Science. If you can find a picture of TSG teaching one of these classes you have the first clue to the code hunt. There are three different pictures of TSG teaching History, Math and Science. If you can find a word that appears in all 3 images you have the second clue to the code hunt. Feel free to talk to your fellow Swagbucks friends using the chat to see who received the newsletter and what image they have.